Mick Dodge: Biography, What Happened To Him, Where Is He Now? Home Showbiz and TV Mick Dodge: Biography, What Happened To Him, Where Is He Now? The modern world may have increased the chances of survival for the human population and helped us experience parts of earthly life in a way that we may not have if not for technological and social development. However, these improvements haven’t come without cost. There has been additional stress, particularly mentally to the day to day life of the average human being. One person who has chosen to let go of this stress is Mick Dodge, who is popularly known as The Barefoot Sensei. In 1991, Dodge decided to leave the complexities of the modern world and retreat into the rain forest. He has been living there ever since and not only has he become an interesting subject televised across the globe, he has survived and by indications, been living a full life. There is plenty to learn about the life of The Barefoot Sensei and we cover some of them below. If you live long enough, you will see things you did not think was possible. While the bulk of the world is spending money and other resources to bring those who are still living in the darkness of crude and rural life into modern society, there are those who wish to go back and have done so. Such a feat has been achieved by Mick Dodge, a former US Marine man who was born on the 29th of August, 1951 to Ronald L. Dodge, a former Marine, and an unknown mother. He is believed to have been born in an area of the Olympic Peninsula named Forks. There, he grew up with grandparents who regularly showed him the wonders of the natural forest. Mick Dodge did not leave the modern world before he was an adult. Via the work of his father as a Marine, he traveled across the world and had his early education and high school in places like Okinawa, Japan. After graduation, he joined the Marine and served for six years. When Dodge returned from service, he worked for a while in an auto repair shop. Due to his upbringing and a natural disposition to live more naturally, he found himself to be out of place in the modern world and set out to live in the forest. He finally packed his bags and left for the rainforest in Washington in 1991 where he has been living ever since. He lived in the forest for over 20 years before he was discovered by the National Geographic network who sought to make a documentary of his life as forest nomad. 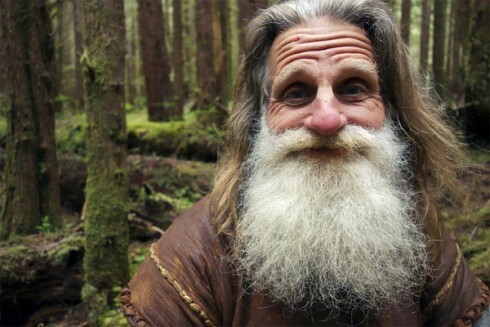 The show about him, which was titled The Legend of Mick Dodge came on air for the first time on January 7, 2014, and it ran for seasons with a total of 20 episodes. It became the first of two major amalgamations between forest-living and modern life that Mick Dodge engaged in. The second was an EarthGym program he started with Jacquie Chandler. The program as the name suggests is a fitness program based on the sole use of natural products and tools as fitness equipment. The program began in 1994 and has continued to exist till date, building a community of people who share a similar interest. It is believed that for a person to make a decision that undercuts reality and the definition of normal, he or she must have suffered from something, most likely trauma which ended up forcing their hand. In the case of Mick Dodge, the story could not be farther from the truth because he simply wanted it. It could be said that the long existing relationship between him and the forest came about as a result of him having spent a large amount of time being raised in and around it. Where is Mick Dodge now? Well, he still lives in the woods. Although the show that made him a national television personality is no longer on air having ended in 2014, he is still very much alive living in the woods as The Barefoot Nomad. The exact reason why National Geographic chose to stop airing the documentary is down to what can simply be termed as creative differences on the part of the network and Mick Dodge himself. For those who may have missed out on the show in 2014 and its subsequent rerun in 2017, there is a DVD set available on National Geographic that includes the unaired third season of the show.